Escape the everyday hustle and cruise into the incredible ice kingdom of Alaska! 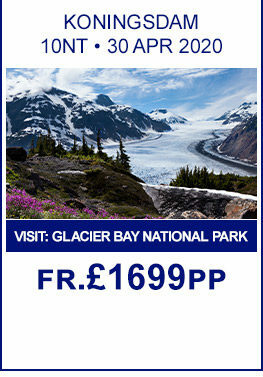 Discover everything from the awe-inspiring blue ice of a massive glacial field to the splendour and diversity of Alaskan wildlife and landscape. A cruise to Alaska offers you the perfect opportunity to explore this mammoth untamed wilderness- spot black bears fishing for salmon in icy mountain streams, humpback whales breaching in the clear glacial waters, roaming caribou herds and soaring eagles. 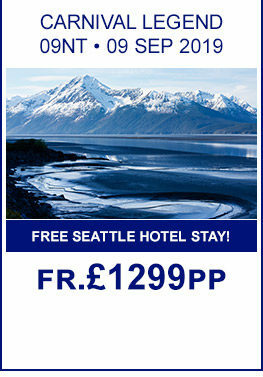 Take a look at our top offers for Alaska! 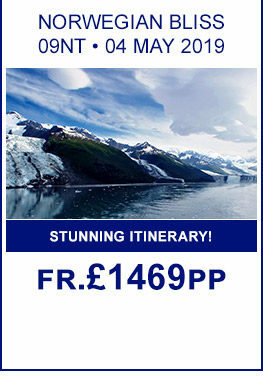 Majority of Alaskan cruises call at the capital Juneau because of its amazing glacial landscape. Don't miss the opportunity of a lifetime dogsled ride and do take advantage of the many shore excursions available such as boarding a seaplane to the Taku Glacier Lodge or getting up-close and personal with a glacier in a zodiac inflatable. 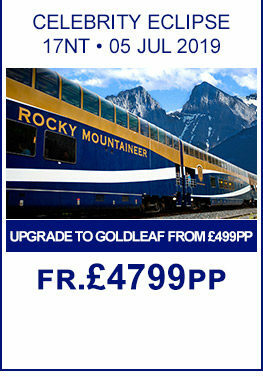 Visit the real frontier town of Skagway and explore a historic gold rush camp. Browse through the cabins and tents here that were once used as bakeries and saloons, admire eagles circling overhead, spectacular wildflowers and stunning mountain scenery. Tracy Arm Fjord is dotted with waterfalls created by melting snowcaps, be on the look out for black and brown bears, wolves, deer and moose as you cruise through the icy waters of the fjord and be sure to keep your eyes peeled for seals and whales. The inside passage will be one of the highlights of your journey, one of the most scenic in the world where the mountains tumble down to the islands of the sea and the pristine scenery and incredible quality of light combine to create a feast for the senses. Admire forests in a hundred shades of green, turquoise glaciers and evocative towns laden with history, culture and adventure! Alska truly is one of the final frontiers for bucket list cruisers!